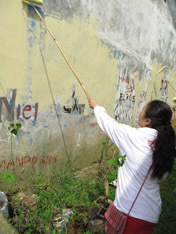 Silonay Elementary School in Calapan City is Malampaya’s Brigada Eskwela recipient for 2012. 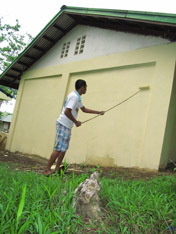 The project is part of Malampaya’s strong education thrust for its stakeholders in Oriental Mindoro. Brigada Eskwela or National Schools Maintenance Week is headed by the Department of Education (DepEd), and is a nationwide clean-up and repair programme aimed at enhancing the value of cooperation and volunteerism in the community. DepEd Calapan East Supervisor Isagani S. Abraham marveled at the large number of parents and barangay residents who flocked to the Silonay school grounds to volunteer to do some manual labour to help prepare the school for the opening of classes in June. School Principal Agnes T. Santiago said this year’s Brigada is focused on school sanitation, particularly the improvement of toilet and wash facilities as mandated in DepEd Memorandum No. 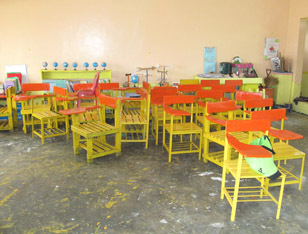 56 issued by DepEd Secretary Armin Luistro. Brigada officially started last May 21 and will last until May 26 after which certain schools will be declared winners in various levels among district and provincial schools based on guidelines set by the DepEd.